Onkyo launches new hi-fi and wireless headphones | What Hi-Fi? Starting at the top, the A800 open-back over-ears (pictured) are geared towards home use. They feature 50mm drivers, and use Onkyo's Acoustically Open design architecture. 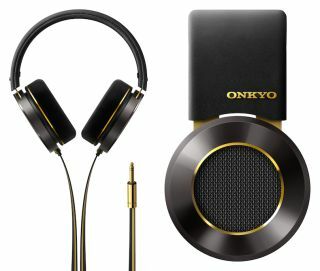 To give a more premium look and feel, Onkyo has opted for a leather headband and velvet and memory foam ear cushions. The A800s cost £320 and go on sale in July. The H900Ms are a closed pair of over-ear cans and cost £230. Like the A800s, they also use 50mm drivers with aluminium housings. Aimed at the portable market, there's an extra-wide headband for added comfort. They're finished in black and gold, a colour scheme that features across the entire new range. The H500M (£130) on-ears feature 40mm drivers in a rigid aluminium housing and a claimed frequecy range of 7Hz to 40kHz. There's a an in-line mic and remote included as standard. Tempted? They're available to buy at Argos and Selfridges now. The H500BTs (£170) feature a virtually identical construction, but with the addition of Bluetooth (including aptX). They're on sale now at Selfridges. At £320, the E900Ms sit right at the top of Onkyo's in-ear range and are a hybrid balanced armature design. Onkyo claims they're "one of the most advanced in-ear heapdhones available today". They feature a black and gold finsh and come with three different sizes of Comply ear tips. You'll have to wait until July for them to go on sale, but you can pre-order a pair now. At £75, the E700Ms (pictured centre) sit much further down the price scale. On sale now, they're a semi-closed design and use custom-built 13.5mm drivers. The E700BTs (£120, on sale March, pictured left)) are, as you can probably guess, the Bluetooth version of the E700M. A single wire running between left and right earbuds houses a battery and in-line remote. The W800BTs (pictured right) aren't strictly a new arrival - they were actually first unveiled at IFA 2015 and caused quite a stir. They're a pair of completely wireless, Bluetooth in-ear headphones. Once the buit-in batteries run out of juice, you can plug them into the supplied carry case, which doubles as a charger. Onkyo claims around 12 hours playback from a single charge. At £230, they're not the cheapest pair of in-ears we've ever seen, but it could be a small price to pay for all that added convenience. A selection of Onkyo's new headphones will be on display on the What Hi-Fi? stand at the Bristol Show, so be sure to drop by and have a listen.